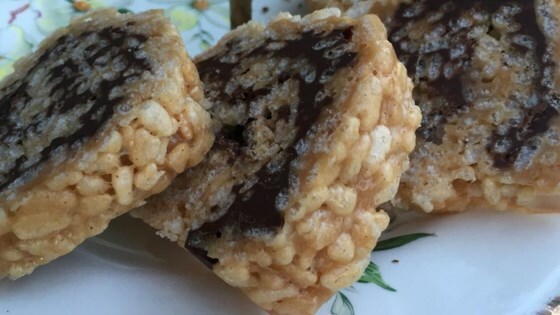 "Delicious variation of the Rice Krispies® treat." Line a 15x10x1-inch pan with waxed paper. Grease the waxed paper. Combine marshmallows, butter, and peanut butter together in a large microwave-safe bowl. Cover bowl and heat mixture in the microwave until marshmallows are melted, about 2 minutes. Stir well. Stir rice cereal into marshmallow mixture until well coated; spread onto the prepared pan. Combine chocolate chips and butterscotch chips in a microwave-safe bowl. Heat mixture in microwave until melted, about 2 minutes. Stir well. Spread chocolate mixture over rice cereal mixture, leaving a 1-inch border around edges. Roll rice cereal mixture around chocolate filling, jelly-roll style and starting with the short side. Peel waxed paper away while rolling. Place roll, seam-side down, on a serving platter. Refrigerate until set, about 1 hour. Cut into narrow slices. Awesome!!! Just the right ratio of peanut butter to marshmallow!! The Rice Krispie mixture was a little too moist and “blew out” the side as I was rolling it. Next time, and there will be a next time, will split mixture into two smaller rolls.